Mr. Smith is a 64-year-old male who was admitted to Jupiter Rehabilitation and Healthcare Center with the diagnosis of acute renal failure and non-healing bilateral lower extremity venous stasis ulcers. Brian lived with his family in a one story home and was independent with activities of daily living (ADL) and functional mobility prior to going to the hospital. 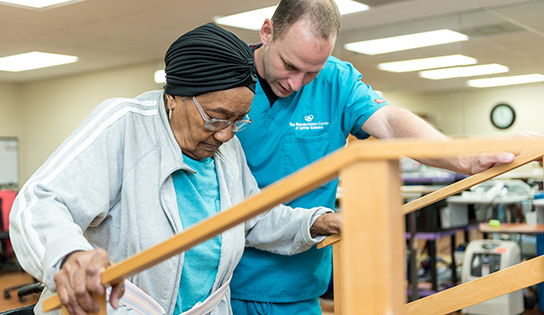 When Brian arrived to our community, he required total assist with self care tasks and functional mobility. Mr. Smith is a veteran. His expedition to join the Navy began when his father was in the Navy. He was a Culinary Specialist, and Brian wanted to follow in the same path. While serving, he developed both his cooking and baking skills. Post discharge, Brian went to school for thirteen weeks in San Diego. He decided to move to the East Coast and went to school in New Port, Rhode Island, and became a security guard. His passion for baking was still strong, working part time as a baker. Brian held both positions for four years. Brian enjoyed exploring; he held various jobs in different parts of the country. He was fortunate enough to change his job every five years. He worked from resorts, restaurants, bars, and hotels, doing what he loves the most; baking. His last job before retirement was working at a plastic plant. He held that position for 16 years. The company was making cassette player covers, and then switched over to DVD covers. Once Blockbuster and Hollywood Video went out of business, they switched over to making pill boxes for Walmart. In 2011, Brian retired from the plastic plant. He moved down to Palm Beach Gardens to live with his brother. He resides with his brother, his girlfriend, her mom, a cat, and a dog. Mr. Smith was admitted to Jupiter Medical Center with a diabetic wound that developed on his leg. He was then recommended to receive therapy and with the help of the case manager he came to Jupiter Rehabilitation and Healthcare Center . It has been a long journey with many obstacles, but Brian persevered through it all, making the minor setbacks into a major comeback. With weeks of hard work and determination, Brian now requires minor supervision to complete activities of daily living and functional mobility utilizing a rolling walker. He is thrilled to be able to return home with his family and start baking again. We are ecstatic that Mr. Smith was able to return home to his family. He worked diligently to get back to the things he loves. From all of us at Jupiter Rehabilitation and Healthcare Center, we wish Mr. Smith the best!